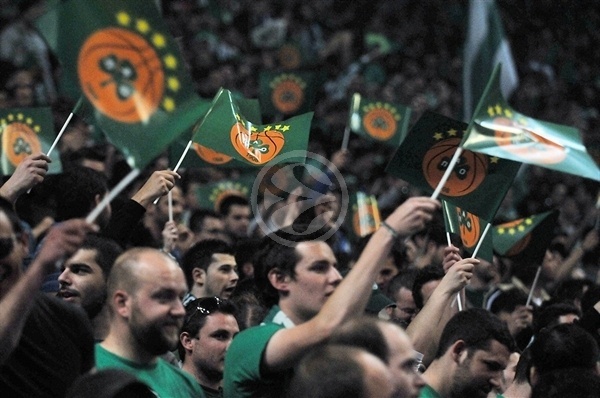 Panathinaikos will head to Istanbul to try to defend its Turkish Airlines Euroleague crown at the 2012 Final Four after holding off Maccabi Electra 86-85 in a classic Game 5 in front of a packed house at OAKA. Euroleague MVP Dimitris Diamantidis capped a fantastic evening with the game-winning free throw with 5 seconds remaining and then a steal on the final play to seal the victory. Diamantidis finished with 25 points, a career-high 34 performance index rating and came within 1 of a playoffs record with 12 fouls drawn. His 15 free throws made established a new playoffs single-game record. The Greens move on to face CSKA Moscow in the semifinals of the Final Four next month. 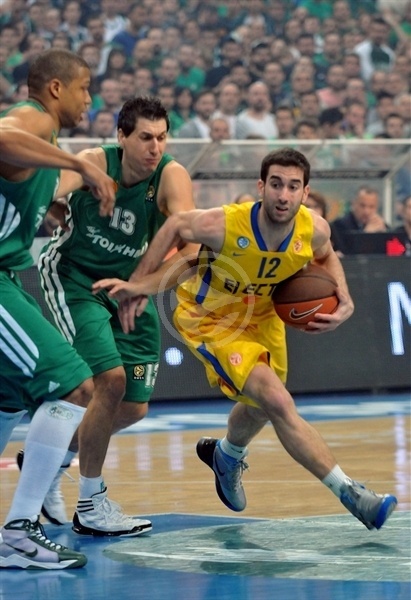 Maccabi, which lost the Euroleague title game to Panathinaikos, is done for the season. Maccabi held a slim 18-20 lead after 10 minutes, but the Greens pushed back and took total control by halftime, 41-32. The lead reached 12 before back-to-back Yogev Ohayon threes highlighted a 12-0 Maccabi run to tie the game at 46-46. Ohayon had a chance to put the Israeli champs ahead from the line, but missed twice. 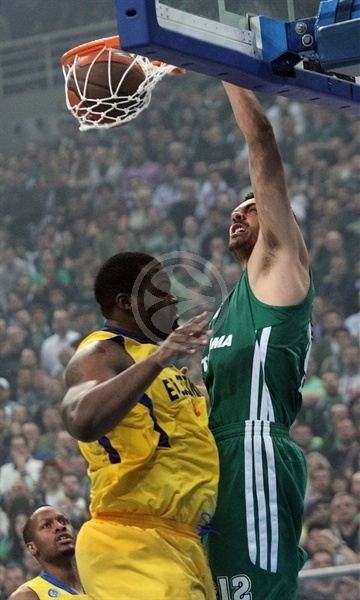 Panathinaikos responded with the next 10 points to regain control. But Maccabi had one last fourth-quarter run in it. Keith Langford closed the gap and Guy Pnini tied it at 85-85 with 9.8 seconds to go. However Diamantidis got back to the line, made the go-ahead free throw and despite missing the second, came up with a big defensive play to secure the win. Sarunas Jasikevicius added 13 points for the winners. David Blu paced Maccabi with 14 points, Langford tallied 11 and 5 assists and Tal Burstein and Yogev Ohayon netted 10 each. Maccabi controlled the opening tip and got on the scoreboard quickly on a Blu jumper. Sofoklis Schortsanitis beat a double team to find Ohayon for Maccabi’s second basket before the classic Diamantidis-to-Mike Batiste pick-and-roll resulted in a basket for the latter. Maccabi’s strong early defense resulted in a Langford layup. 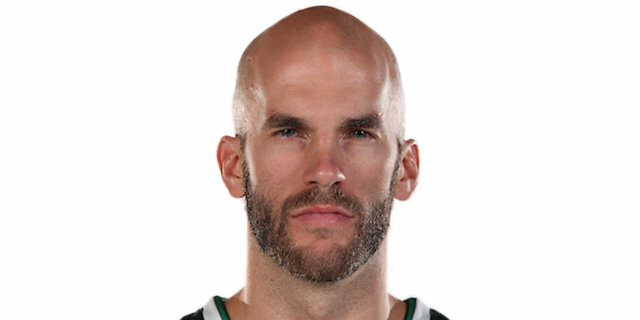 Nick Calathes soon sank the game’s first three-pointer to make it 5-6 and Diamantidis followed by tying the game from the line. Batise gave the Greens their first lead with a second-chance hook shot, however Blu responded from downtown to make it 8-9 midway through the quarter. After a timeout, Batiste and Langford swapped layups and leads. Then Richard Hendrix followed a Steven Smith basket with a monster jam. Reserves Lior Eliyahu for the visitors and Kostas Tsartsaris for the hosts both scored in the paint to make it 15-15. Romain Sato put Panathinaikos up 1 from the line. A second foul on Hendrix forced Maccabi coach David Blatt to call upon Shawn James, who made it 11 visitors on the floor in the opening quarter. Burstein drilled a three that gave the visitors an 18-20 lead after 10 minutes. Ian Vougioukas tied it for the hosts with a basket in the paint. Eliyahu and Jasikevicius traded baskets in rapid succession. Batiste beat a double team with a pass to a cutting Kostas Kaimakoglou to make it 24-22. James made an impact on the defensive end, while Devin Smith battled on the offensive glass and drew fouls on back-to-back possessions and sank free throws to tie the score. Diamantidis free throws put the hosts back on top. 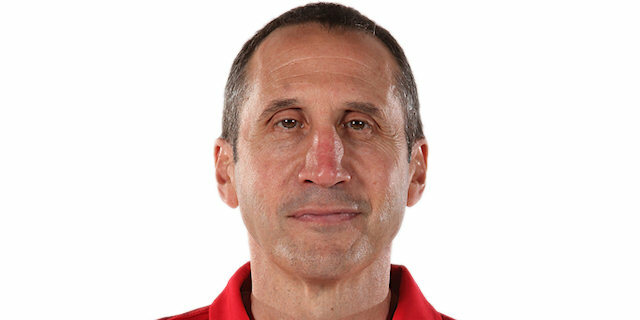 Blatt was assessed a technical foul for arguing a call and Diamantidis took advantage by making the resulting free throws and a tip-in on the offensive glass to put the Greens up by 6. An Ohayon- to-James alley-oop got Maccabi going again, but a Batiste tip-in and Diamantidis free throws made it 34-26. Devin Smith sank a pull-up jumper only to see Jasikevicius hit back with a three-pointer. 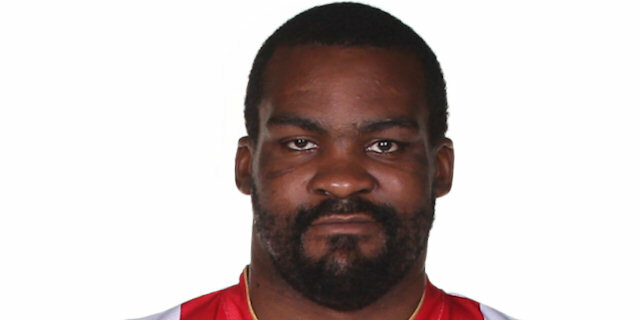 Schortsanitis got his first points of the game with 3 free throws over two possessions. Devin Smith narrowed the gap to 7, but Saras answered back with 2 from the charity stripe. Burstein shot at the buzzer was blocked by Tsartsaris as the hosts went into the locker room up 41-32 at halftime. 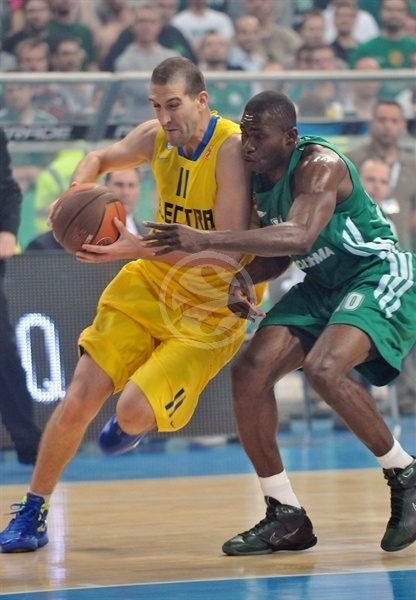 Stratos Perperoglou drove to give Panathinaikos its first double-digit lead after the first play of the second half. A basket by Hendrix underneath was bettered by Diamantidis to put the Greens up 12. Baskets by Hendrix and Blu sandwiched an offensive foul by Diamantidis. Then Ohayon buried a three-pointer and Maccabi was suddenly within 46-41. A second Ohayon triple capped a 0-10 burst as Panathinaikos called timeout after seeing its lead slashed. The timeout did not stop the visitors as Hendrix sank a short jumper to tie the score and silence the crowd, 46-46, midway through the third quarter. Ohayon went to the line with a chance to give Maccabi the lead, but missed twice. 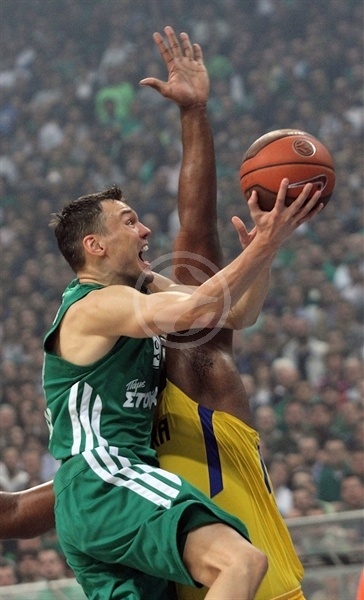 Instead Perperoglou banged in a long jumper to rescue the Greens and Jasikevicius hit a pull-up jumper. A Kaimakoglou triple made it a 7-0 run for the hosts. Perperoglou added another triple to make it 56-46 before Devin Smith scored for Maccabi. Vougioukas free throws restored a 10-point lead and his fade-away jumper made it 12 before Burstein sank a three at the buzzer for a 62-53 line. Perperoglou answered with another big jumper early in the fourth quarter. 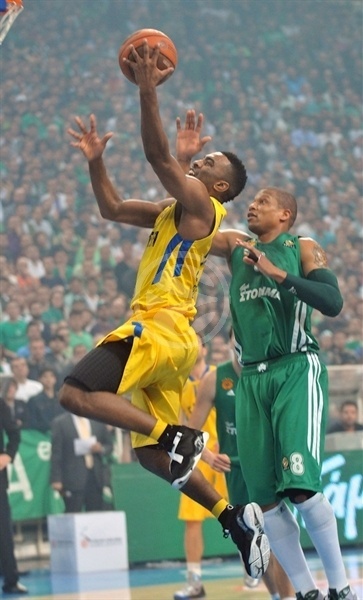 Maccabi went to Schortsanitis down low for a few baskets, but the Greens kept scoring to negate the damage. A David Logan fast break slam put the hosts ahead 68-58. Aleks Maric came off the bench and scored in the paint for a 12-point lead. 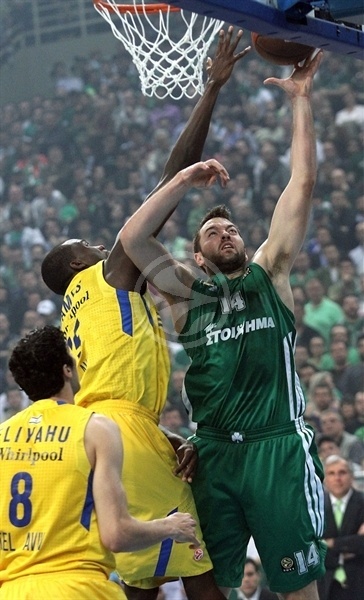 Guy Pnini answered with a three only to see Diamantidis match him as OAKA rocked and rolled. Ohayon penetrated for a layup and Blu hit a long jumper as Maccabi tried to make another push. After a timeout, Pnini stripped Diamantidis and Blu hit another jumper to make it 73-67 with just under four minutes remaining. A Langford follow basket cut the deficit to 5. Calathes found Maric inside for an important slam and Blu missed his next shot. Vougioukas extended the lead to 78-69 with 2:23 remaining. Pnini kept Maccabi in the fight with a triple. Maric split free throws. Devin Smith drove for a layup, but a tough layup by Diamantidis kept the Green in control. Lanfrod struck a quick three to get within 81-77 with 1:15 remaining. After Devin Smith fouled out, but Mric missed two from the line, Langford clawed Maccabi within 2 with 53.3 seconds left. Kaimakoglou was fouled at the basket with 32.6 seconds left, but missed both free throws. Langford tried to tie it, but missed. Langford fouled out with 15.7 seconds left and Diamantidis made it a two-possession game by sinking both free throws, 83-79. Hendrix found a cutting Blu for a basket-plus-foul that took just 3 seconds off the clock to make it a 1-point game. 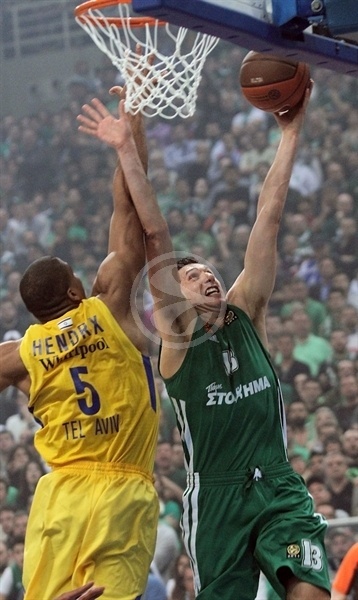 Diamantidis was back at the line with 11.3 tics on the clock and made both for an 85-82 score. Pnini went for a long three and was fouled with 9.8 seconds to go. Pnini made them all to tie the game at 85-85. Diamantidis drove and drew a foul with 5 seconds left. He made the first, but missed the second. Burstein rose for the rebound and turned to lead one final attack. However Diamantidis tipped the ball away and Maccabi did not get off a last shot as Panathinaikos held on for the win and a trip to Istanbul. "We are once again in a Final Four and this is a target we have achieved through a difficult road. We deserve to be here, although it is the first time we were obliged to play five games. It was a game with too much tension and pressure, but we made it despite the difficulties and I want to congratulate my players and thank our fans. It was very special. I had that feeling from the very first moment of the game. At the end it was a matter of details, but I think that we dominated. Congratulations to Maccabi, because they are a great team and played the game until the end. I respect them and I enjoy playing against them. We had a tough summer, you know what I mean? We managed to keep the team united and we are here again. We don't know what is going to happen next summer, but the players are fighting. To tell you the truth, the current level of the team will not be enough to defend our title at the Final Four. We need more players to help the team and this is my goal for the next month." 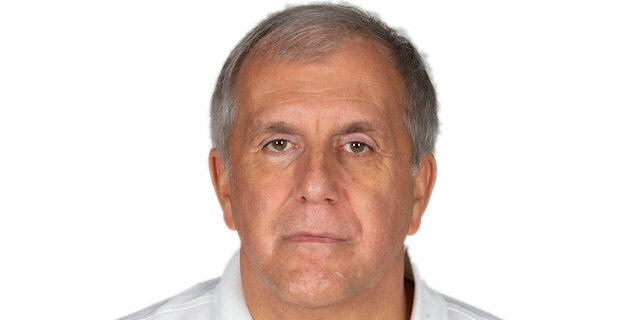 "First of all, congratulations to Zeljko Obradovic and his assistant Dimitris Itoudis, because they did an excellent job during the series. I wish them good luck in the Final Four. I think we saw and enjoyed one of the greatest series ever played in European basketball. Details decided the winner, and also Dimitris Diamantidis, who is my... Nemesis! I like him as a person, but I don't want to see him in front of me in the future. He is a great player. He was named the 2011 MVP and he can be it again. Big players show up in crucial games. I would like to lock him in his hotel room! Panathinaikos was a little bit better than Maccabi. I am trying to say something smart, but I can't find it. We feel honored to play in front of such a crowd. At the end of the day, I am proud of my team and of my players, because the tried very hard." "It was the epitome of a basketball thriller and I am not talking only about Game 5, but the whole series. We are very happy and proud of what we have done, but we cannot celebrate due to the unbelievable pressure we suffered in the last 16 days. However it was a fantastic playoffs series and a great advertisement for basketball. We had a 12-point advantage, but didn't keep it. Sometimes things look easy, but they become difficult in a very short time due to mistakes." "What can I say after all that happened in these series? Especially tonight it was a crazy game, with a lot of ups and downs. We suffered, but we won and reached our target, to make it to the Final Four. We are excited and we are looking forward to playing in Istanbul and defending our title." "To beat Panathinaikos, guts and heart are not enough. You must have good tactics and keep your concentration, something we lacked in the crucial moments. It's all about a screen that should have been better. On the other side we committed fewer mistakes and dished more assists than them, but we missed our target. It was an outstanding basketball game, with a lot of tension." 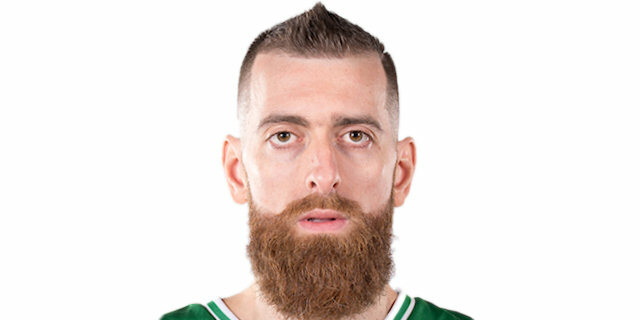 "To be honest I don't know, I don't remember what happened in the last play of the game, when Diamantidis defended me and got the ball. It was a great game and great series. We came very close to the victory and this is the reason I feel very disappointed. Congratulations to Panathinaikos for their success and I hope that we will have a better luck in the future. I think that after we beat Panathinaikos in Game 2, we had a great chance to finish the job in our house, but it didn't happen."